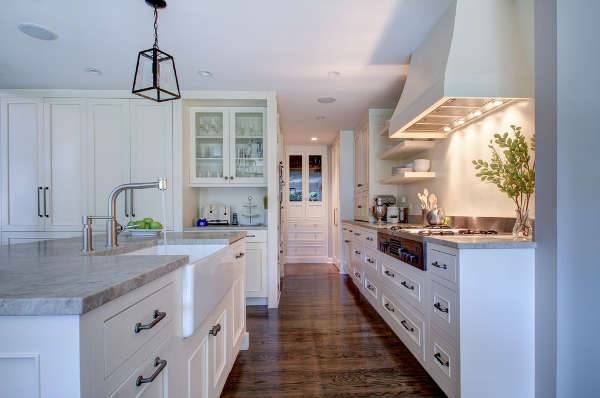 A modern farmhouse kitchen has a perfect mix of traditional and contemporary trends. Dark coloured curtains and exposed wooden beams go well with polished wooden floors. Get matching leather seats for the modern kitchen and boost up the looks of the chamber with a stainless-steel sink. If you have a small farmhouse kitchen, white walls with black window frames can create a good mix of colours. Install a small rectangular wooden table in the centre and get wide glass windows. A traditional sink in a corner can serve the purpose well. A traditional farmhouse kitchen looks elegant, with dark wooden ceiling and exposed logs. A hardwood floor can complement the cultured looks of the ceiling. 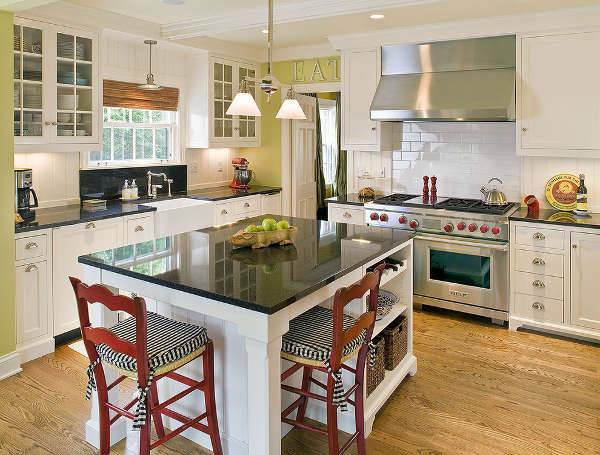 Get dark black furniture for dining purposes and you can install a white kitchen island to boost up the looks. 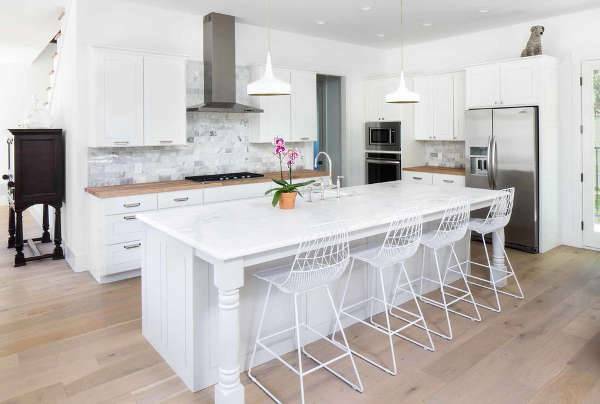 White kitchens look sophisticated indeed, and if you want to enjoy a bright interior, fix bright pendant light in the kitchen. To strike a suitable colour contrast, you can get brown cabinets for the floor and walls and install white wooden decks on the walls for storage. 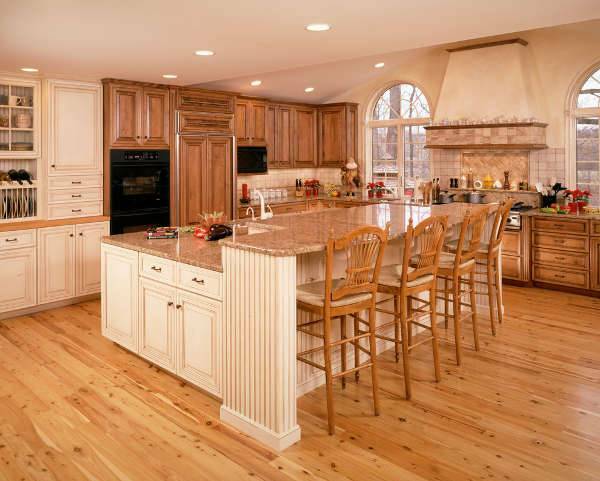 If you have the traditional taste embedded with elegance, get a touch of dark weathered wood in your kitchen. 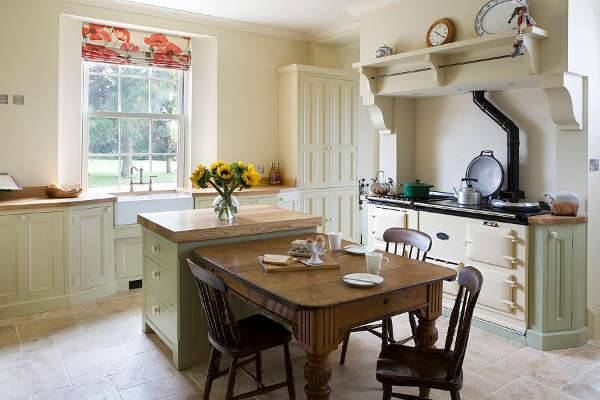 Wood coloured floors, rugged edges of logs and well-burnished cabinets add to the vintage flavour in the kitchen. 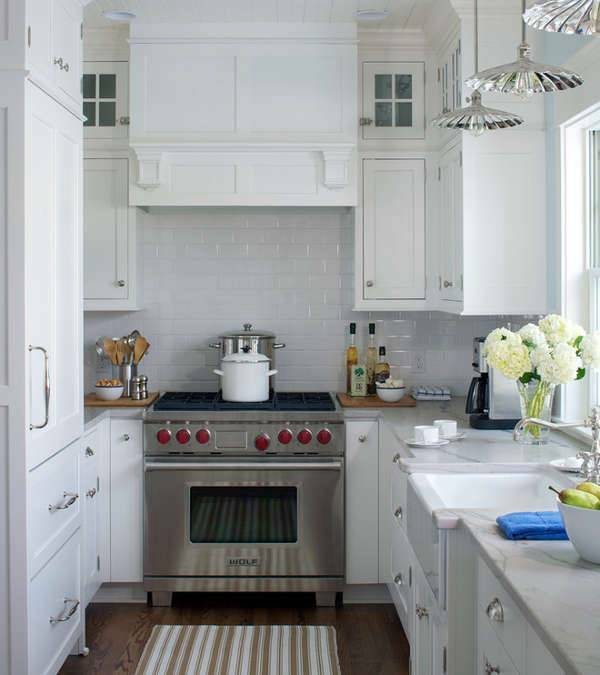 White walls with glass cabinets make the farmhouse kitchen look younger and modern. 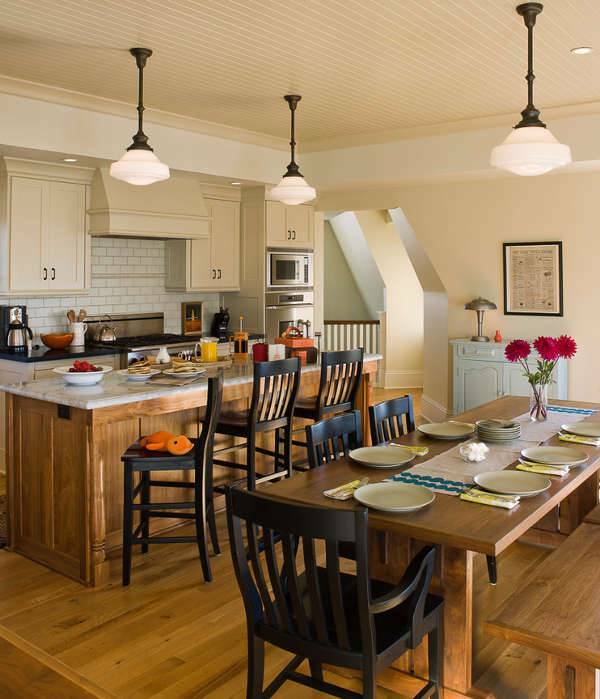 If you crave for a country farmhouse kitchen, arrange for wide decks on the walls. Paint the walls in spotless white and place your crockery on the decks. A wood-coloured tiled floor can serve the flooring purpose well in this case. You can buy dark coloured wooden cabinets and shelves for the kitchen. 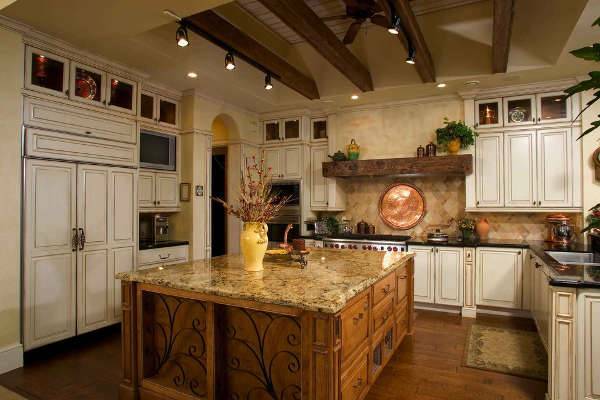 A farmhouse kitchen in the Tuscan style can deliver an elegant look to the kitchen. Polished wall cabinet along with complementing floor cabinet can be placed along the walls. Install the kitchen island in the centre of the room and fix pendant light in the log-ceiling to yield the perfect look. 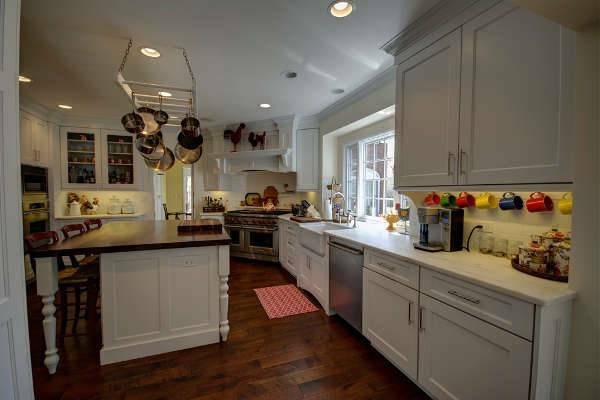 If you have a spacious kitchen, you can remodel it into a large farmhouse kitchen. White walls and windows go well with these kitchens. You can also opt for a tray ceiling to add a modern touch to it. Place a long wooden table in the dining space and complement it with matching chairs. Get a beautiful retro sink for the farmhouse kitchen, which can turn out to be the focal point of attraction. Black and white interior colours for the farmhouse kitchen looks elegant. Use these two colours for the walls to make the beauty more pronounced. Exposed beams look sophisticated in a farmhouse kitchen. The raw wood colour delivers a rustic look to the chamber. Avail checked curtains for the windows. You can choose a dark colour, for instance, brown for the combination and opt for another light colour for the curtains. Traditional styles of living are creeping back to the urban settings, and you can get some modern accessories in a farmhouse kitchen. You may also incorporate the small kitchen ideas in your home. Living trends are evolving and new country kitchen designs are on the cards. 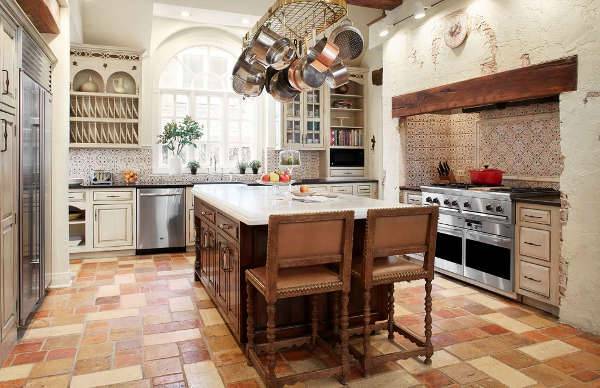 You can share your own farmhouse kitchen designing ideas with us, if you come up with something innovative.